SARS-Like Virus Found In Jordan, Hunt Is On For Other Cases : Shots - Health News The latest cases represent the oldest known so far. They push the SARS-like virus's timeline back three months from the first reported case involving a 60-year-old man who died in Jedda, Saudi Arabia, last June. Coronaviruses can cause a mild cold or severe pneumonia-like symptoms. 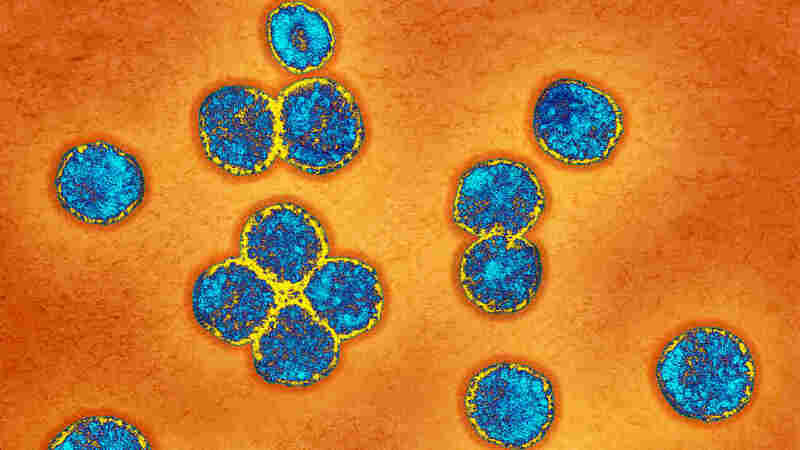 The World Health Organization says a new coronavirus has killed two people in Jordan — the third country where the novel microbe has been traced. That brings lab-confirmed cases to nine, with five fatalities. The latest cases are actually the oldest known so far. They push the SARS-like virus's timeline three months back from the first reported case involving a 60-year-old man who died in Jedda, Saudi Arabia, last June. Jordan's cases were found through new testing of blood and tissue samples from patients in a cluster of pneumonias of unknown origin that occurred last April at a hospital in Zarqa, near Jordan's capital of Amman. Until now known cases have occurred further south in Qatar and Saudi Arabia. The Jordan cases are also significant because they're part of an 11-person cluster of pneumonia that involved seven nurses and a doctor. It's unclear whether either of the two new SARS-like cases involved health care workers, or whether the new coronavirus has been ruled out yet as the cause of the other pneumonias in that outbreak. But whenever disease-trackers see clusters of infection involving caregivers, that raises their suspicion that a microbe has spread from person to person — most likely from patient to caregiver. It doesn't have to mean that. Health care workers and patients could have acquired the infection from a shared environmental source. But if the new virus is able to spread from person to person, even if inefficiently, that raises the possibility it can become more mobile, moving through human populations. "Even if the cases in Jordan were human-to-human spread — and we don't know that — it wasn't sustained," WHO spokesman Gregory Hartl told the Canadian Press. The possibility of person-to-person spread is also suggested by a cluster of coronavirus pneumonias reported on November 23 involving members of the same household in Riyadh, Saudi Arabia. Four men in that family fell ill with respiratory symptoms and two tested positive for the new coronavirus. The two others, one of whom died, are considered probable cases. No one thinks that the new coronavirus is as big a threat as its notorious cousin, the one that precipitated the SARS epidemic in 2003 that quickly spread around the world and killed 916 people. For one thing, health officials haven't found any cases of the new coronavirus among the millions of pilgrims who attended this fall's annual Hajj in Mecca, near the place where the Saudi man died in June. On the other hand, nobody knows how big a problem the Arabian coronavirus may be — or even whether it is likely to be restricted to Arabia. The WHO is urging medical and public health workers around the world to investigate clusters of unexplained pneumonia for a possible link to the new virus. It isn't calling for individual cases to be tested. The agency "is convinced that whatever the source of the virus is, it is probably not unique to those countries," science journalist Helen Branswell writes in Scientific American. Genetic testing suggests that the new virus is most closely related to one in bats. But that doesn't necessarily mean all human cases had direct contact with bats. There may be an intermediate carrier, and victims might have eaten food contaminated with dust, urine or feces from an infected animal. At this point, it appears that researchers will find more human cases of the new virus. Each case, or cluster of cases, increases the chance that the source and mode of transmission will be found. That effort will be accelerated by the development of a blood test for the virus, which Branswell reports may come in the next month or so. Right now diagnosis relies on a gene-amplification test, called PCR, which is cumbersome and sometimes hard to interpret. And it can't tell if someone had been exposed to the virus in the past but recovered.